"The Revoke A50 petition has reached 2.7M and rising fast. Brexiters will do everything in their power to dismiss it as irrelevant but there must be a target point - 5-8M? - where MPs and commentators take it seriously." Another extraordinary, historic day in the Brexit process yielded more drama on Betfair markets as the biggest related betting market to date - Will the UK leave on 29/03/19 - was finally all but settled. Throughout the afternoon, a big gamble developed about an on-time exit, without a deal, as EU leaders disagreed over whether and how long an extension to Article 50 was acceptable. At one stage that eventuality shortened to [4.1] as the mood turned particularly febrile - a joint declaration by the entrenched political foes of the CBI and TUC that we are facing a national emergency summed up the situation. Eventually, a new deadline of April 11th was announced, which seems to have foiled that gamble. Leaving in seven days time is now available to back at [34.0]. The threat of no deal, however, is far from dead and perhaps likelier than ever, albeit a few weeks down the line. April-June has hardened to [2.3] (43%) to be the Brexit Date. What now? Despite Tuesday's speech blaming MPs and politicians drawing ridicule and condemnation across the political spectrum, Theresa May remains in post. A consensus is forming that these are her final days in the job is forming though. She's rated [2.5] to go between April and June - advised last week at [4.2]. Next, the PM will put her Meaningful Vote to the Commons for a third time (assuming Speaker John Bercow accepts whatever small changes are presented amount to a material difference). Latest odds on Betfair of [3.5] imply it has a 29% chance of passing. Even that is probably an overestimate for a couple of reasons. First May's antics and rhetoric has completely alienated opponents on all sides of the House. MPs do not like being made scapegoats and targets for abuse - especially when many blame her leadership. And now A50 has been extended, this vote no longer involves the cliff edge, which might have bullied them into submission. MV3 will probably lose by a similar margin, in excess of 100. Then, MPs will try once again to take control of the process. Although such moves have failed before, most parliamentary commentators think it will pass this time. At that stage, all options are on the table, however briefly. Parliament will, if able, take a series of 'indicative votes' to see if what, if anything, there is a majority for. One amendment - tabled by Kyle/Wilson - calls for a second referendum to confirm the Withdrawal Agreement. Another will seek to find cross-party consensus on 'Common Market 2.0'. That or another amendment may find a majority for customs union membership. It is easier to see a majority emerging for the latter than a second referendum, although that cannot be ruled out. There will be a huge 'Peoples Vote' march on Saturday and, if Remainers wanted a show of strength, the petition to revoke Article 50 may begin to change the conversation. At the current count, the petition has reached 2.7M and rising fast. Brexiters will do everything in their power to dismiss it as irrelevant but there must be a target point - 5-8M? - where MPs and commentators take it seriously. Revoking A50, even temporarily, would also give MPs time to make up their minds and parties to change leaders if necessary. Nevertheless, revocation or other Remainer projects are up against it. The bottom line remains that, to stop or delay Brexit for any length of time, the UK will have to participate in Euro elections and furious Leave voters must be faced down. There is no appetite among politicians for obvious reasons, particularly on the Tory side. Therefore at some stage over the next fortnight, MPs will realise they must agree on something to avoid the new cliff edge of April 11th. There will be talk of a long delay but that is totally unacceptable to the Conservative Party. May will continue to posture as ready for no deal. There will be more talk of a snap general election and a no confidence vote may be required to unseat May. However all this is too time consuming given the short deadline, very hard to find agreement upon, and uncertain to produce a clearer outcome. Could Corbyn lead a cross-party deal? My instinct is that the Commons will indicate a majority for a softer form of Brexit. Jeremy Corbyn was in Brussels again yesterday and the Labour leader seems likely to be able to get changes to the political declaration to that effect. MPs will eventually pass the WA, but tie the government's hands to a customs union. Again, this is anathema to the Tories but this may end up as the only alternative to no deal. If so, they will need a new leader to sell it to an overwhelmingly pro-Brexit base. I've long mooted a scenario where Michael Gove becomes Conservative leader via a coronation. This could happen within days. The Telegraph report him to be in pole position. Leadership contest or not, Gove is excellent value at [6.4] to succeed May. While Brexit itself offers numerous betting options, they are all extremely unpredictable. I've already cashed out the bet advised earlier this week on May leaving before Brexit. Having originally taken [1.71], I've laid back at [1.59]. 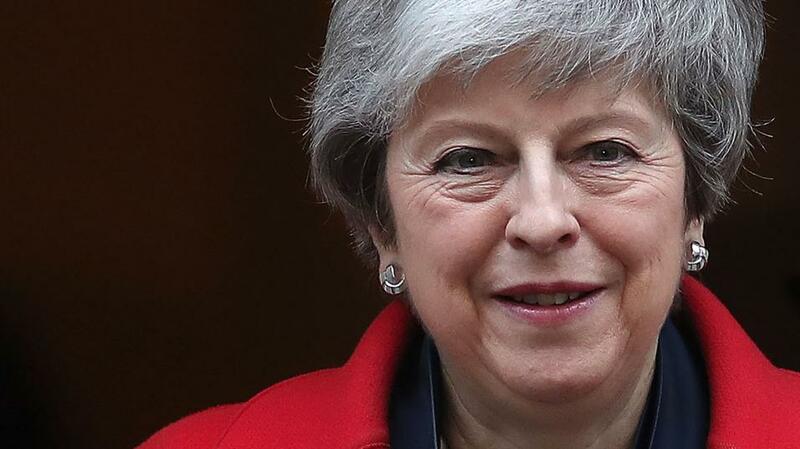 I do think she will be gone very soon but she could easily remain nominally in charge until a leadership contest, post-Brexit, is concluded. One confident prediction. If this does result in no deal, or with May's deal passed amidst great acrimony, with opponents feeling as if they've been blackmailed, there will be no coming together after Brexit. The campaign to Rejoin will start immediately.